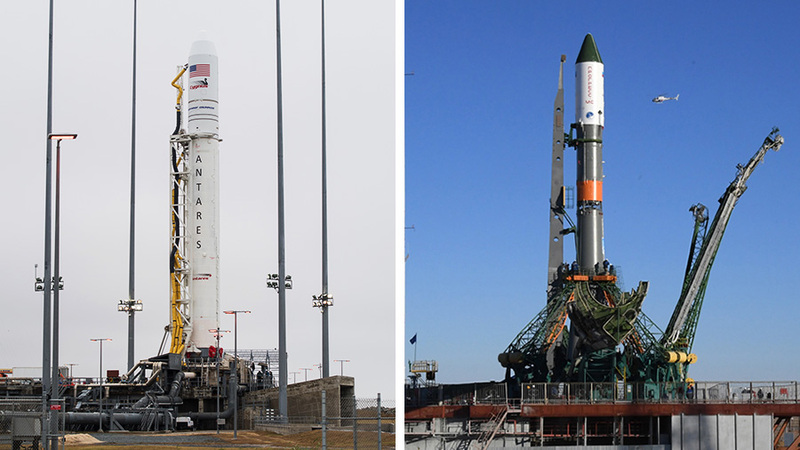 Two rockets stand at their launch pads on opposite sides of the world. Northrop Grumman’s Antares rocket (left) with its Cygnus cargo craft on top stands at its launch pad in Virginia. Russia’s Progress 71 rocket is pictured at its launch pad at the Baikonur Cosmodrome in Kazakhstan. Dismal weather on Virginia’s Atlantic coast has pushed back the launch of a U.S. cargo craft to the International Space Station one day to Friday. Russia’s resupply ship is still on track for its launch to the orbital lab from Kazakhstan less than nine hours later on the same day. Mission managers from NASA and Northrop Grumman are now targeting the Cygnus space freighter’s launch on Friday at 4:23 a.m. EST from Pad-0A at Wallops Flight Facility in Virginia. Cygnus sits atop an Antares rocket packed with approximately 7,400 pounds of crew supplies, science experiments, spacesuit gear, station hardware and computer resources. Cygnus will separate from the Antares rocket when it reaches orbit nine minutes after launch and begin a two-day journey to the station’s Unity module. Its cymbal-shaped UltraFlex solar arrays will then unfurl to power the vehicle during its flight. Expedition 57 astronauts Alexander Gerst and Serena Auñón-Chancellor will be in the cupola to greet Cygnus Sunday and capture the private cargo carrier with the Canadarm2 robotic arm at 4:35 a.m.
Russia rolled out its Progress 71 (71P) resupply ship today at the Baikonur Cosmodrome in Kazakhstan where it stands at the launch pad for final processing. The 71st flight of a Progress cargo craft to the orbital laboratory is scheduled for launch Friday at 1:14 p.m. Cosmonaut Sergey Prokopyev will be monitoring the arrival of 71P when it automatically docks to the rear port of the Zvezda service module Sunday at 2:30 p.m.
Gerst and Prokopyev started Wednesday morning training for the arrival of 71P. The pair practiced commanding and manually docking the vehicle on a computer in the unlikely event the Russian cargo craft is unable to dock on its own. Gerst then moved on to Cygnus capture training after lunchtime with Auñón-Chancellor following up before the end of the day. NASA TV will cover live the launch, capture and docking of both Cygnus and Progress on Friday and Sunday.